Republicans in the House of Representatives have spent this week breaking down the oppressive regulatory regime the previous administration put into place. 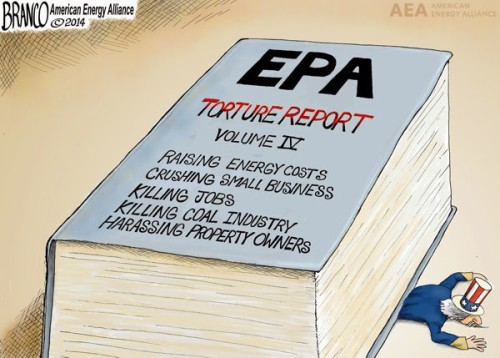 Former President Barack Obama dramatically expanded the influence of the executive branch through agencies like the Environmental Protection Agency(EPA). House Republicans are now working to pass legislation that mitigates the impact of overreaching federal policies, but barriers in the Senate could make this a difficult task. The House has taken up two pieces of legislation this week to combat EPA overreach. First, the Satisfying Energy Needs and Saving the Environment Act or SENSE. The legislation exempts certain coal power plants from 2012 environmental regulations in order to foster growth within the industry. Innovation within the private sector to lower national energy costs should be encouraged, not regulated out of existence. This is not a new idea. In fact, in 2013, just after the Obama Administration implemented ridiculous compliance demands, the House passed a nearly identical version of SENSE; however, the legislation lost momentum in the Senate when Obama announced his plans to veto the bill. Additionally, the Blocking Regulatory Inference from Closing Kilns Act “prohibits the Environmental Protection Agency from requiring compliance with Clean Air Act rules concerning national emission standards for hazardous air pollutants with respect to brick and structural clay products manufacturing or clay ceramics manufacturing until judicial reviews of the rules are complete.” Since EPA rules are so often challenged in the courts, this prevents companies from paying compliance costs just for a regulation to be removed. Unlike the controversy surrounding SENSE, this Act has already received bipartisan support Senators such as Roger Wicker (R-Miss.) and Joe Donnelly (D-Ind.). BIA executives believe industry leaders have invested over $100 million in EPA regulation since 2003 which have been later overturned in courts. The second piece of legislation’s bipartisan support in the Senate should mean easy passage, garnering the 60 votes necessary to pass most measures has proven consistently difficult. Even without President Obama to call for a veto on SENSE, the Act will inevitably struggle to find nine or ten Democrats willing align with the Republican agenda. The best strategy for passing legislation right now for the Senate is an attachment to the funding bill coming in late March. With an omnibus spending rule, Republicans can attach critical items like these as amendments to the legislation to institute comprehensive and passable reforms. The House’s decision to combat the growth of the EPA regulatory regime could assist in protecting U.S. energy production and lowering energy costs, but only if they find an avenue to pass the legislation through the Senate as well. Senate Republicans should force Democrats to vote to close U.S. businesses and raise energy costs. But if and when that fails, attaching these items to the funding bill could be the only viable path forward.